Di-imide reduction with a twist: A Möbius version. The regiospecificity of di-imide reduction of an alkene. Not a few posts on this blog dissect the mechanisms of well known text-book reactions. But one reaction type where there are few examples on these pages are reductions. These come in three types; using electrons, using a hydride anion and using di-hydrogen. Here I first take a closer look at the third type, and in particular di-hydrogen as delivered from di-imide. This reagent tends to be specific for terminal (less highly substituted) double bonds. Two ωB97XD/6-311G(d,p) calculations predicts a free energy discrimination of 2.85 kcal/mol for the two double bonds in the system above, which works out as a ratio of 125:1 in favour of the less substituted system. The Wiberg bond orders of the two forming C-H bonds indicate that at the transition state the one to the less substituted terminal carbon is more highly formed (0.234) than the one to the more substituted carbon (0.198). 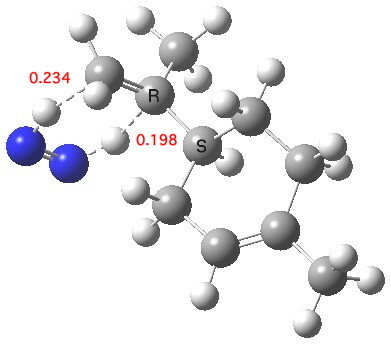 The NICS(0) magnetic index of aromaticity at the ring critical point (centroid) of the pericyclic participating atoms has a value of -22.2 ppm, which indicates a significant diamagnetic ring current indicative of a (σ-aromatic) transition state. The two transferring hydrogens have predicted “aromatic” shifts of 11.6 and 10.5 ppm. Transition state for di-hydrogen transfer. Click for 3D. From IRC 3 to -3, it represents a pericyclic process, involving an (aromatic) transition state in which the six atoms involved are all co-planar. From IRC -4 however, the newly reduced C-C bond starts to rotate to change the conformation from syn-planar to gauche. This rotation only comes at the very end of the reaction. No real surprises here then, but it is useful to know that the regiospecificity of such reactions can apparently be well predicted. This entry was posted on Sunday, November 25th, 2012 at 9:21 am and is filed under Uncategorized. You can follow any responses to this entry through the RSS 2.0 feed. You can leave a response, or trackback from your own site. The regiospecificity of di-imide reduction of an alkene. is licensed by Henry Rzepa under a Creative Commons Attribution-Noncommercial-Share Alike 3.0 United States License.